After felling a tree, living or dead, regardless of what the end use is, there are typically two main processing jobs you will need to complete. First, you will need to remove the tree’s limbs, that is, its branches. This is known as limbing or snedding. Second, you will need to cut the tree into sections, a task described as sectioning. 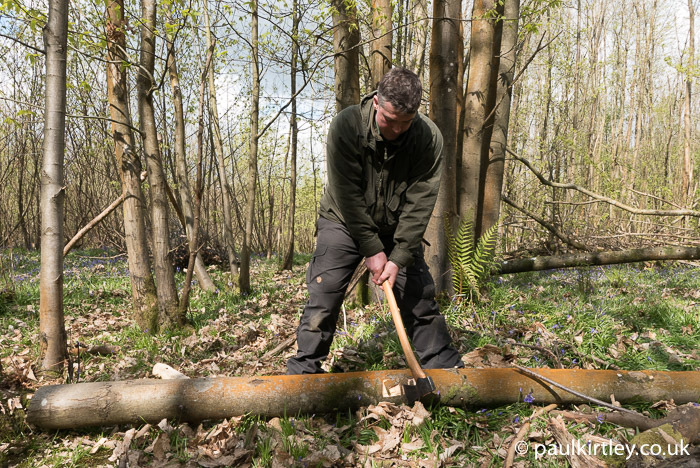 In a previous article I looked in detail at felling trees using axe and saw. Limbing and sectioning trees comes after felling. So, in the present article I want to continue on from the previous article, looking at how you can use your axe to process the tree once it is on the ground. In Axe Safety In Camp: Care, Attention And Good Habits I took a methodical look at fundamental axe safety for day-to-day usage around camp. In the axe safety article I related a series of questions to ask and here, in the context of limbing and sectioning, they are worth repeating as they apply 100% to these jobs too. “Where does it go next?” is a question you should always ask when using a cutting tool. What happens if I slip? What happens if it glances off? What happens if it cuts straight through what I’m working on? What happens if I miss? What happens if it bounces off? In each of these cases, where does it go next? You never want the answer to the question of where it goes next to be part of your body. Especially when it comes to using an axe. In the context of a felled tree, however, the axe is not the only risk. The tree itself can also pose a threat to your safety. 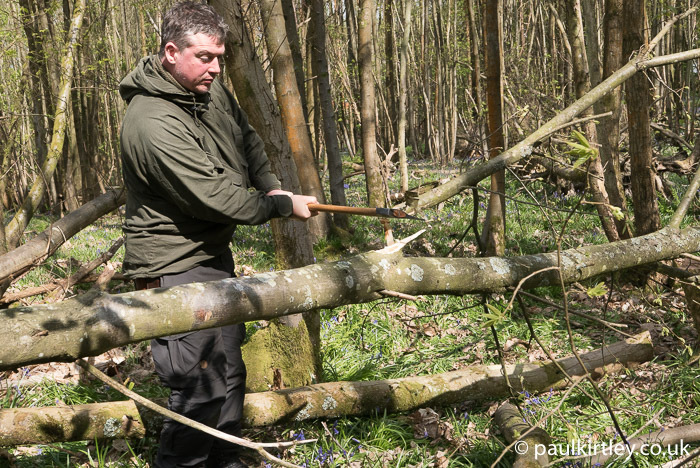 Branches of the tree can be bent, under tension that will release when you start cutting them. 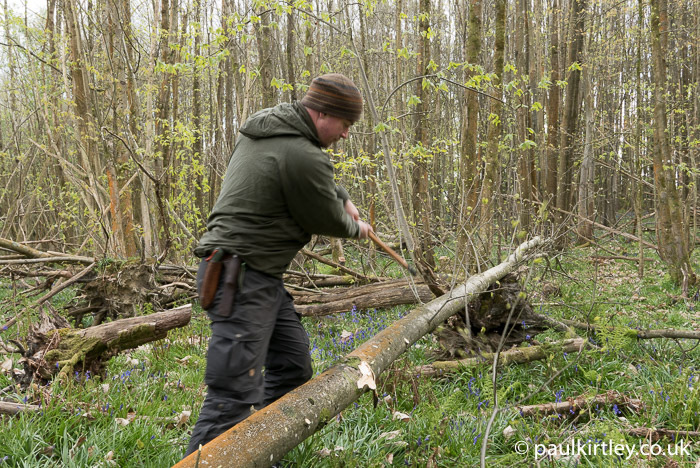 Equally, smaller trees may be bent out of position by the felled tree, potentially releasing to their upright position when you start dismantling the felled tree. 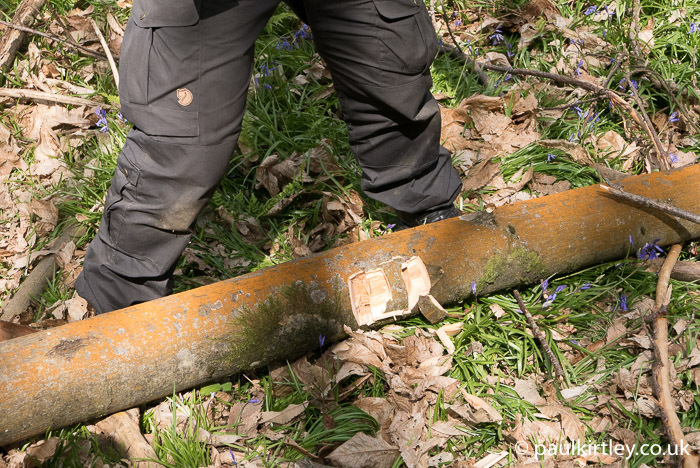 Before you start work on the felled tree, take some time to be fully aware of what, if anything, has been spring-loaded by felling the tree. 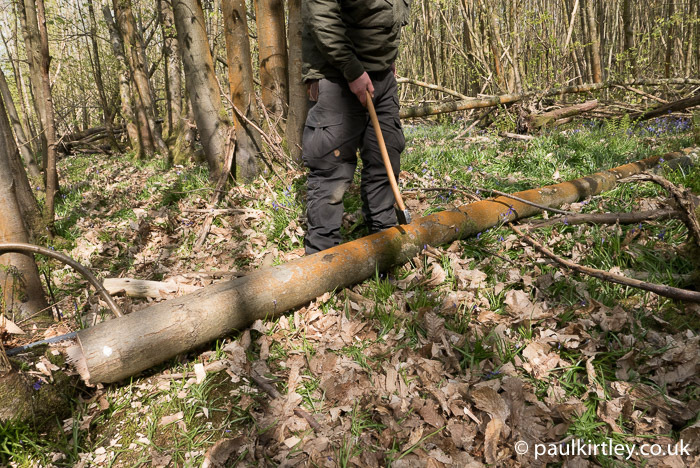 If the felled tree is supported at one or more points along its length, rather than in complete contact with the ground, then, as you cut it, changing the balance of the trunk, some of the tree could rise up or part of the trunk could drop to the ground, or both at the same time. Basically, as you cut the trunk you may end up with one or two see-saws which want to move. Be aware of how the tree is resting before you start work. 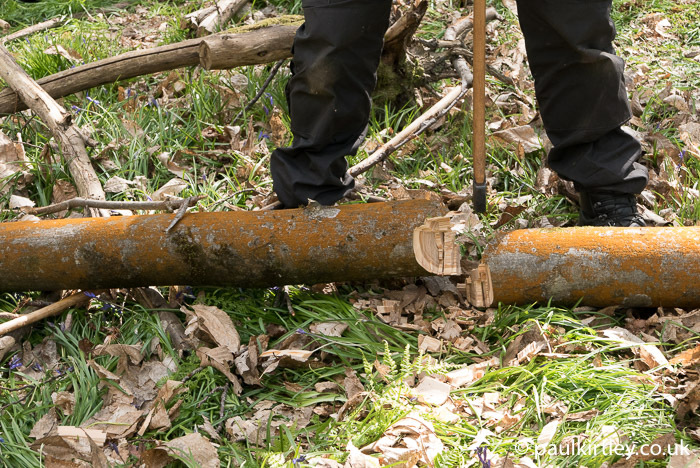 If you are working on sloping ground, pay particular attention to whether any section of trunk that may drop to the ground when detached is likely to roll towards you or your companions. In a nutshell, think about what the separated bits of the tree you are about to create will do – under the forces of gravity and spring-loading – when you free them from the rest of the tree. There are some other technique-specific safety points in the relevant sections below too. The indicated strike point on the trunk is just past my knee and at that point the axe will be moving away from me. Technique 1 – double handed grip – I stand square on with my shoulders pretty much parallel to the trunk. Technique 2 – one handed grip – I can stand sideways on and effectively cut just behind me, again away from my body. The same side-and-behind one-handed technique as above but with a longer-handled axe. Note I am holding the handle half-way long for more control. The axe follows through beyond my body and away from it. Working safely past my body even on a small tree. Limbing A Tree – Bottom Up or Top Down? When limbing or snedding a tree, start from one end of the tree and work towards the other. This is partly about being methodical but also partly about being efficient. 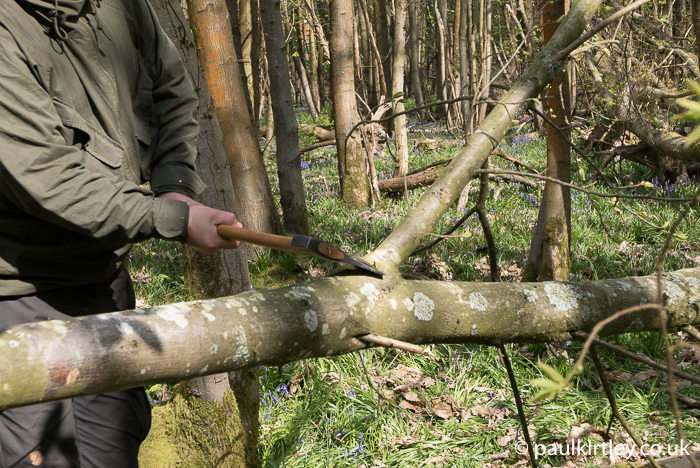 It’s generally easier to cut off branches, large or small, if you attack them from the direction of the less acute angle between them and the trunk. For example, many needled trees have downward sloping branches, whereas many broadleaved trees have upward reaching branches. Attack the branches from the direction they are growing away from. Even if you are removing what are little more than twigs, you’ll find it much easier working this way. Working methodically from the bottom of the tree towards the top. 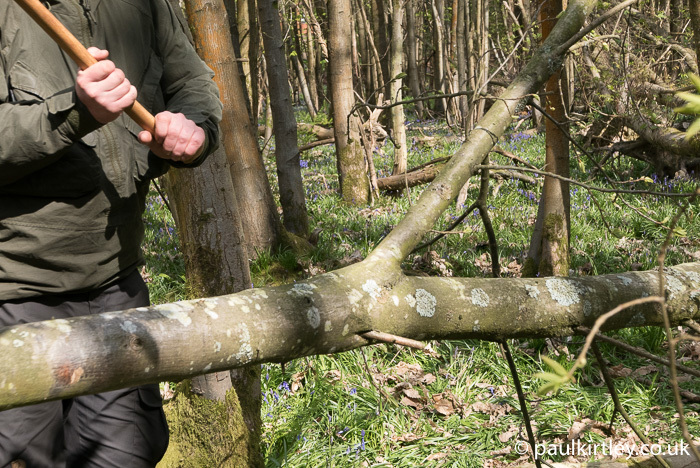 When limbing it is generally a good idea to work with the axe on the other side of the trunk to where you are standing as much as possible. This helps with safety as it significantly reduces the chance of a glancing blow deflecting towards you. Other times you may have to work on top of the trunk to cut off more vertically-oriented branches. It can help to bend your knees to set yourself at a suitable height for gaining a more horizontal chopping action. You should position yourself so that the branches you are striking with the axe are either directly in front of you or even further through your swing. Put another way, you do not want the branches you are cutting to be between you and where the axe starts moving. In the latter case, the follow-through after the axe cuts the branch is towards you and path of the axe head is less predictable, and possibly less controllable, than before the axe collided with the wood. The follow-through after the axe strikes the branch, therefore, should be beyond you. Safe follow-throughs can be achieved in a number of ways. You can stand so that you swing the axe horizontally past you in a forehand motion, with the strike in front of you or slightly past you, and the follow through of the axe being past you. Or you can turn so you are cutting backwards, with the strike to your side and follow-through behind. The latter is much more easily effected with the axe in one hand. This is easy enough with half-length or three-quarter length axes with typical head weights of 0.70-0.90 kg (1.5-2.0 lb). 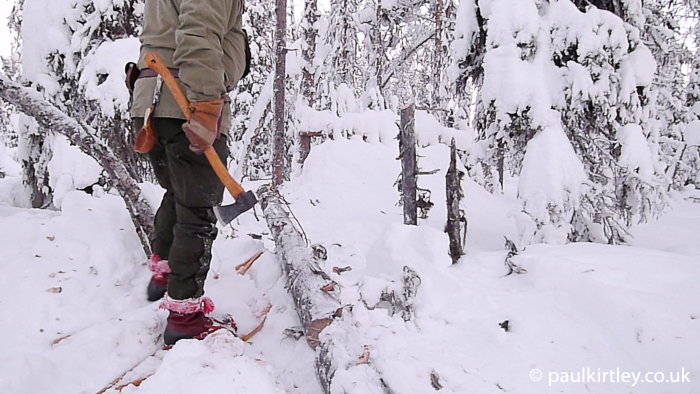 Using a full-size felling axe one-handed for snedding is unwieldy both because of the head weight as well as the handle length. Indeed, the handle length alone can make a full-size axe awkward to use for limbing. 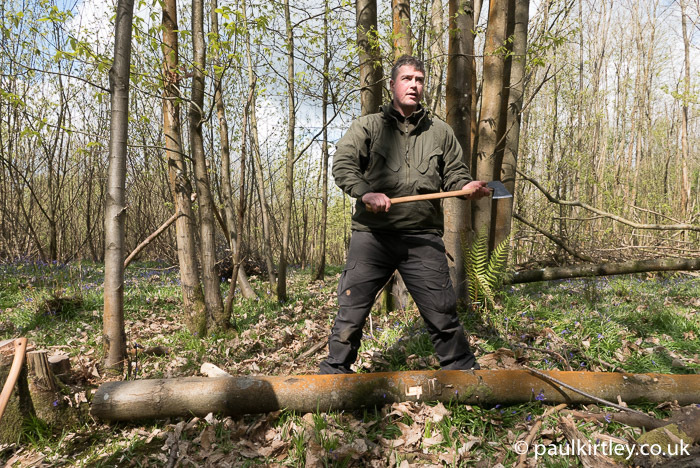 Having a half-length or three-quarter length axe purely for limbing makes sense if you are working in an area of woodland and undertaking plenty of felling with a full-size axe. 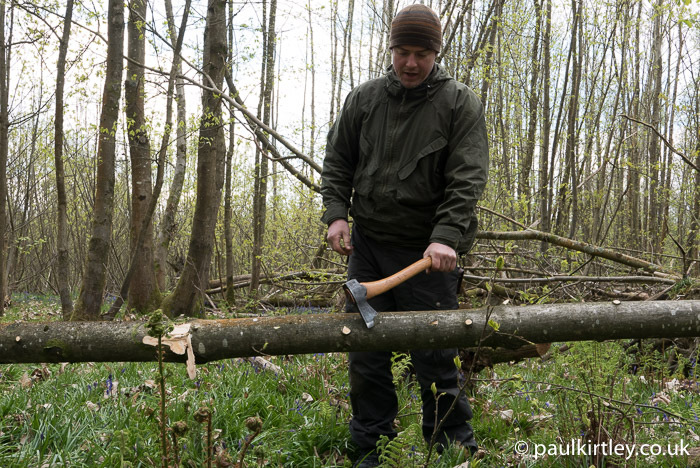 If you can only take one axe, the three-quarter length axe is a very good compromise if you are mainly felling, limbing and sectioning and hence is my choice of axe for winter camping in the northern forest. 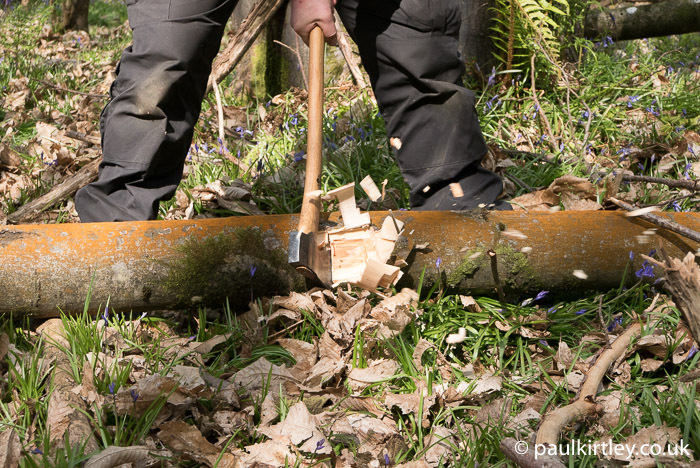 For a general purpose all-round versatility and packability, the half-length axe is a suitable compromise for all the tasks necessary from felling to small firewood splitting and carving, but you lose significant amount of weight and leverage for felling, even over the three-quarter length axe. See the middle section of this article for more information on the differences in weights and sizes of these axes. 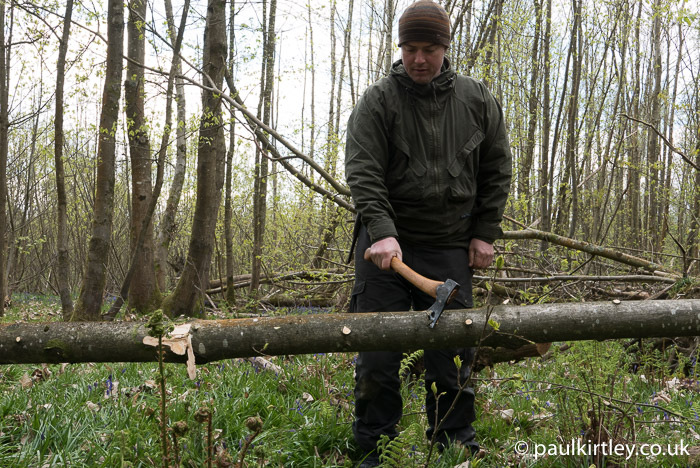 With a good quality axe, well-maintained and sharp, you can cut through branches of significant size with one cut. You do need to be committed, though, and positioning of your body for safety is paramount. 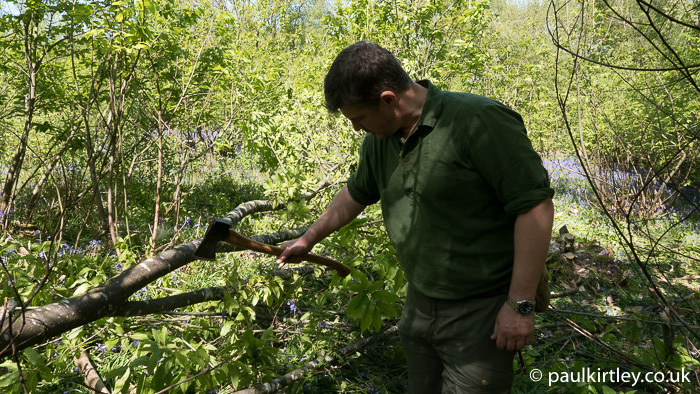 For thicker branches, which cannot be chopped with one cut, start with a couple of cuts to created a V-notch then cut through from the back of the V.
Reasonably-sized branches of up to a couple of inches in diameter can easily be removed with one swift clean cut. Tackling a larger branch, I again have positioned my body behind the point the axe will strike. The strike point is just ahead of being in line with my hip. Another more downward cut will remove a V-shaped chunk of wood from the branch, so I can take it off with the following cut. And with a definitive, near-horizontal strike with an axe, the branch – here in mid-air – is removed. The follow-through with the axe is past my body. Unless the tree is quite small, once you have removed its branches, you’ll need to section it into smaller pieces in order to move it. 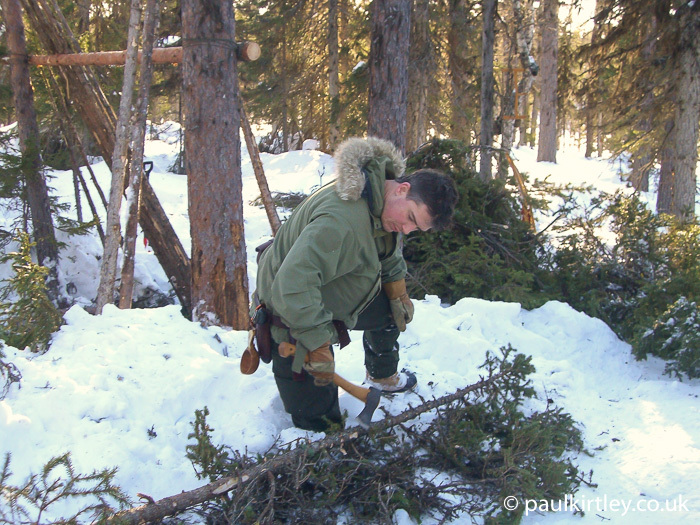 When I am winter camping in the boreal forest, I tend to cut the dead wood I have felled into section lengths as long as I can physically carry on my shoulder. It’s an obvious point but do think about the end use of the wood before you go hacking it into short sections. Not only do you need to think about the required lengths for the end use but also where knots, kinks and other imperfections are located. 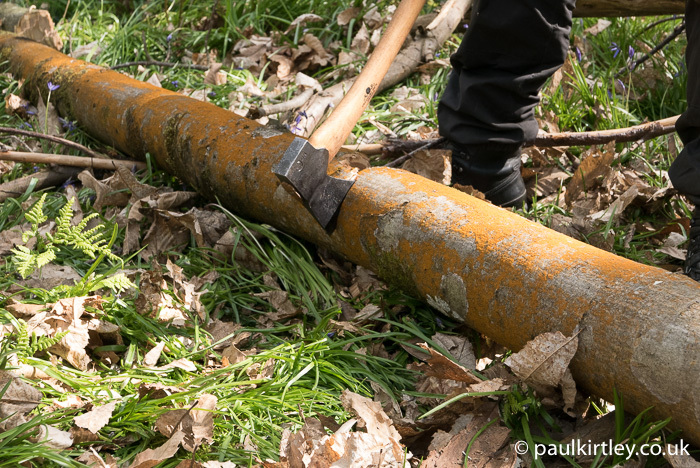 For some uses, even splitting for firewood, knots can be problematic. In the present article I am going to discuss sectioning with an axe but it should be mentioned that in a number of respects sectioning with an axe is less efficient than using a suitable saw. Axes are good chopping and splitting tools. They work particularly well along or at a slight angle to the grain. They cut much less well across the grain. Saws on the other hand cut well across the grain. 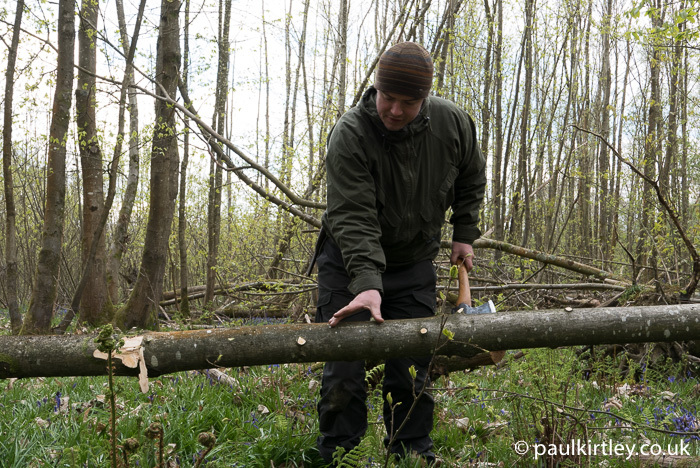 Further, to cut through a log with an axe, you have to waste more wood than with a saw. That said, saws can easily get stuck in logs if they become pinched in the cut. Equally, saw blades of shallow depth will tend to wander as soon as they go even a little bit off line. This can cause the saw to jam too. If you don’t have a saw with you, or if you don’t have a saw big enough to tackle the diameter of wood, then the axe is your only choice. 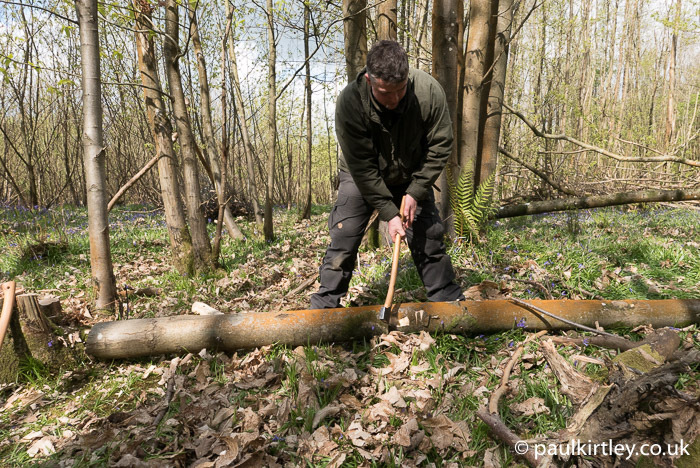 It’s certainly possible to fell a tree with axe and saw but for the trunk of the tree to be too thick to section with the very same saw. This is because the felling job does not require you to saw through the whole trunk, only part of trunk that remains at the back of the tree after you have made front cut with the axe. As you can see, there are a number of reasons why sectioning with an axe is a skill you should have in your repertoire. Standing behind the log I am about to section. I will attack it on the opposite side to my legs with the axe. 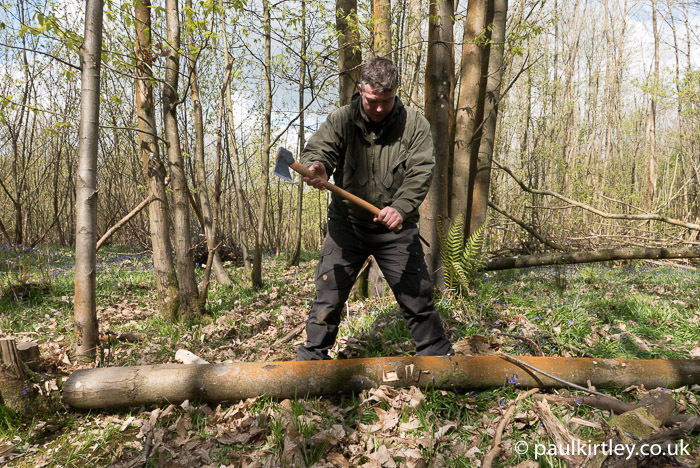 Depending on the length of the axe, you may need to bend your knees and/or your back so the axe strikes the trunk squarely, rather than glancing over the top towards your legs. 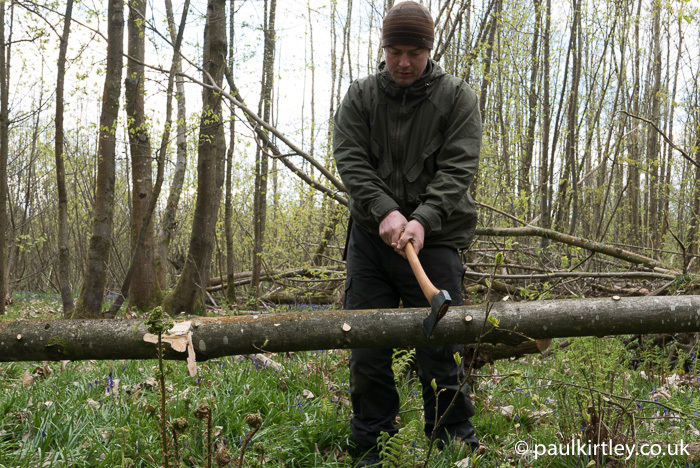 To cut through a trunk with an axe, you need to make the cut much wider than the cut made by a saw. To this extent, you will waste more wood than if sectioning with a saw. 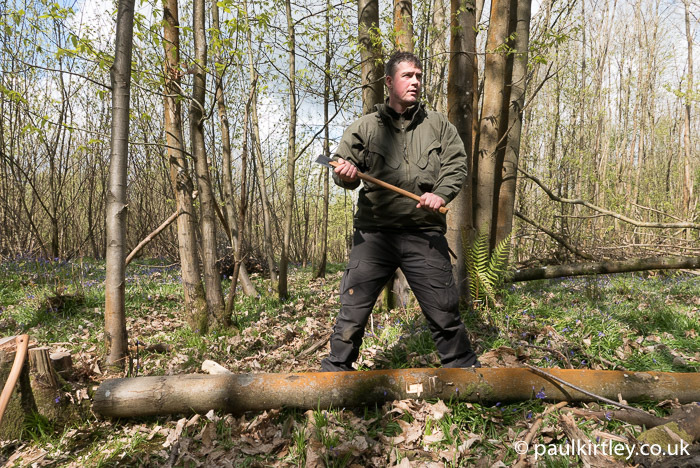 The rule of thumb for sectioning with an axe is to open up a cut as wide as the diameter of the trunk. 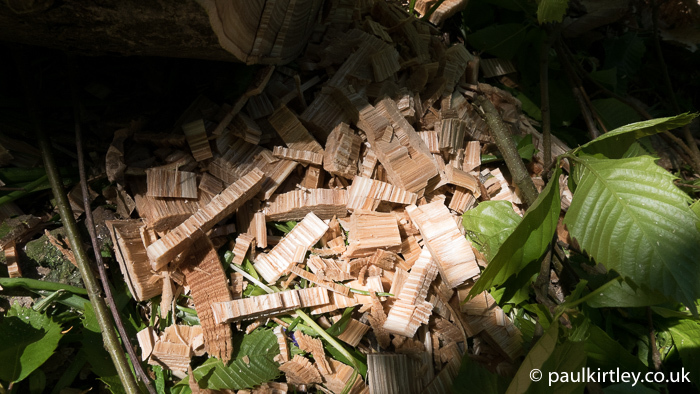 This allows you to remove wood quickly from the trunk and then when around half way through, you can switch sides and bring the cut into the middle from the other side of the trunk. 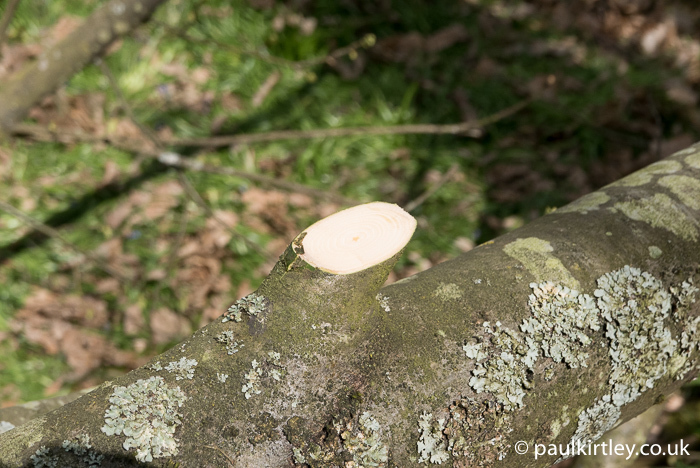 The rule of thumb is to cut out a notch as wide as the diameter of the tree. A common mistake is to try to cut into a narrow V. Cutting into the apex of any V-cut with an axe is inefficient. 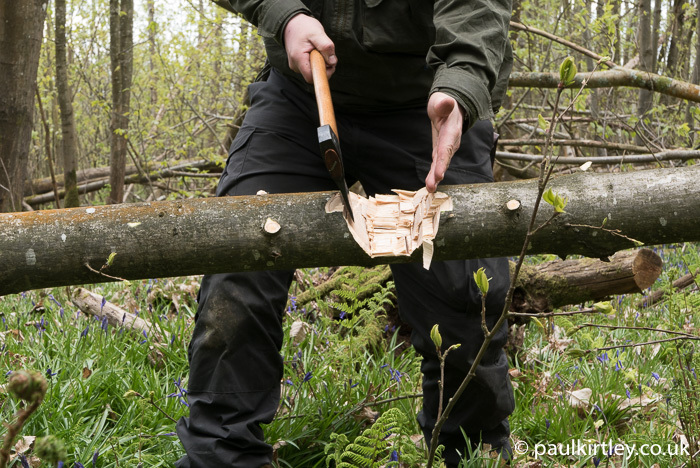 Instead, you should aim to remove chunks of wood by methodically and progressively working an area with the axe, altering the angle somewhat in order to encourage the wood to fire out of the cut. Please excuse the play on words but remember to open wide and produce chunks. Chunking out a notch to section a small tree. Note the chunks flying out of the cut. It continues to be easy to remove material from the base of the notch when it is this wide. 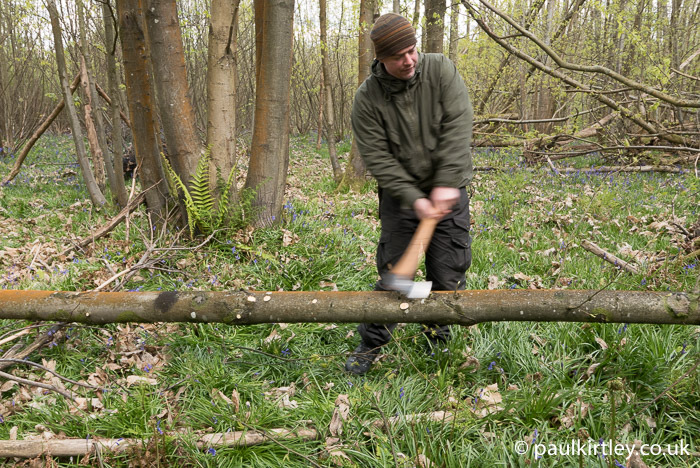 Chunking out wood from the notch on the log at ground level, using a larger axe. Note the spacing between where the axe has cut. This allows chunks of wood to be removed in one go. Once about half-way through or a little more, move to the other side of the log and continue as before. Getting close to being all the way through here. Just throttle back on the power here so you have a little more control. 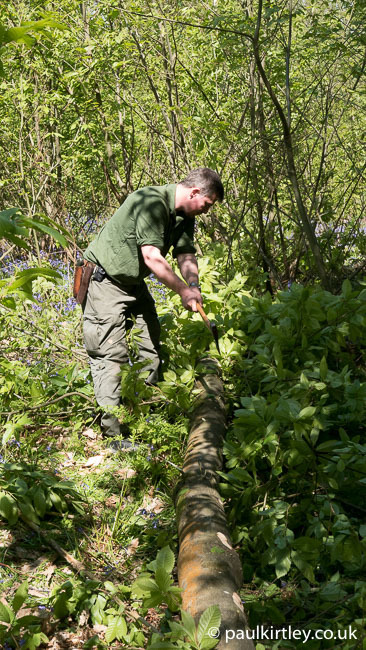 A couple more cuts and it will be through and on the same side of the log as your legs. The final cut. Note where the axe is relative to the log. Also note how one end of the cut log has fallen and the other risen. 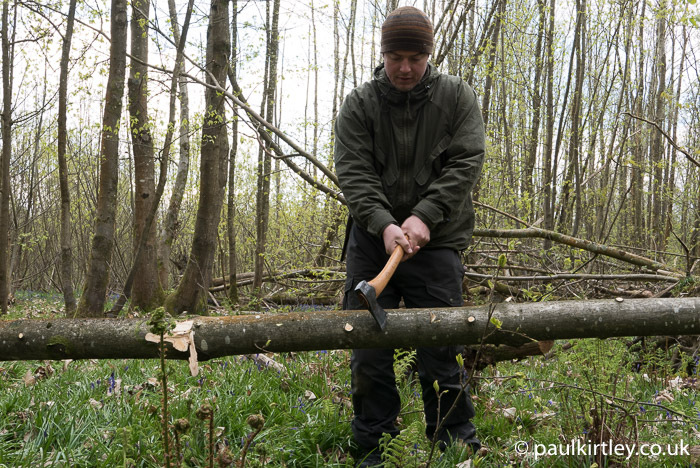 Most right-handed people are happy to use an axe left-handed and they don’t even realise it. Equally, left-handed people are happy to use an axe left handed and don’t realise they are doing so. When swinging an axe most people tend to lift the head with their dominant hand and hold their non-dominant hand at the end of the handle to guide the axe. It’s relatively easy to learn to use it the other way around too as all you are doing is learning to guide with your dominant hand. To understand this, it’s first easier to deconstruct the action and think about chopping using only one hand to hold the axe. Right hand (my dominant) lifting the head, left hand guiding the swing from the back. Left hand lifting the head, right hand guiding from the back. Right-handed use of the axe with two hands. Left hand is guiding at the rear. Left-handed use of the axe with two hands. Right hand is guiding at the rear. Chopping with my right (dominant) hand holding the axe. Chopping with my left hand holding the axe. This is awkward and I am twisting my back. It’s down to the hand positioning, which is the opposite of how it should be to attack from the left. Comfortably swinging the axe, accurately guiding with my left hand. The beginning of the switch. Just after the axe has stopped I start to remove my previously guiding left hand, while gripping the handle with my right. My left hand now slides forward into position to lift the head of the axe. At the top of the lift and about to swing down again. My right hand is now guiding, the opposite of the previous swing, and I can comfortably swing the axe from left to right. At the bottom of the swing. My hands are the opposite to the previous downward swing and the angle of attack is angled in from the other side. I can do this without twisting my back or other awkwardness. Learning to use the axe ambidextrously allows you to attack at all the angles you need to create a symmetrical cut and to remove material quickly by changing the angle of attack from left to right and right to left. When using a larger axe it’s even more important. If you can learn to use the axe ambidextrously, not only is your technique more efficient, it’s also better for your back in the long run. Not many people bother to learn this or even know about it but it is well worth the effort. Safety and efficiency are the watchwords of axe use. 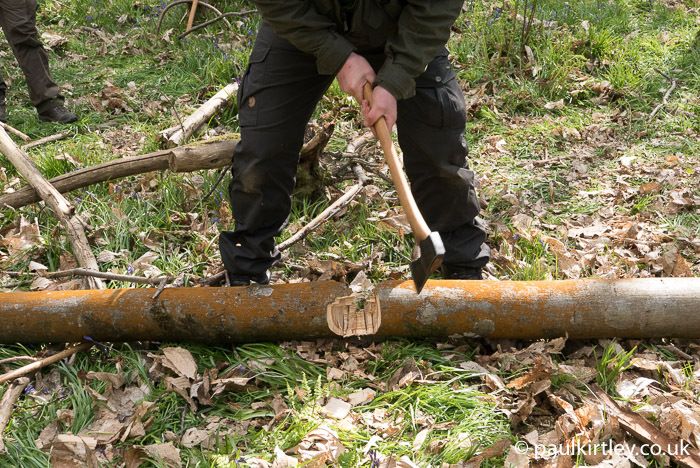 If you diligently apply the above techniques and safety considerations, they will serve you well in undertaking some of the larger-scale tasks you might undertake in the woods with an axe. I’ve grown up in the presence of some fine woodsmen and done much axe work myself over my 71 years. I have taken many Boy Scouts on camping trips and I feel the axe is one of the most taken for granted camp tool going. A carelessly wielded axe can really ruin your day! So instruction in the safe and proper use and care and feeding of an axe is, to my mind, of paramount importance. I congratulate you on a very well presented lesson on axemanship… well done sir! Thank you Tim. Kind words indeed and much appreciated. I greatly value having your perspective on this piece. 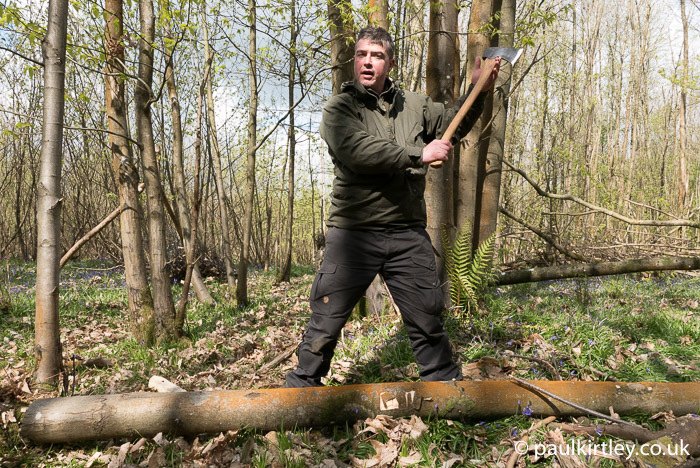 Excellent article on axe wielding – I have not done much axe work myself but I did work for a while in the woods whilst getting my chainsaw certificate (many years ago!) 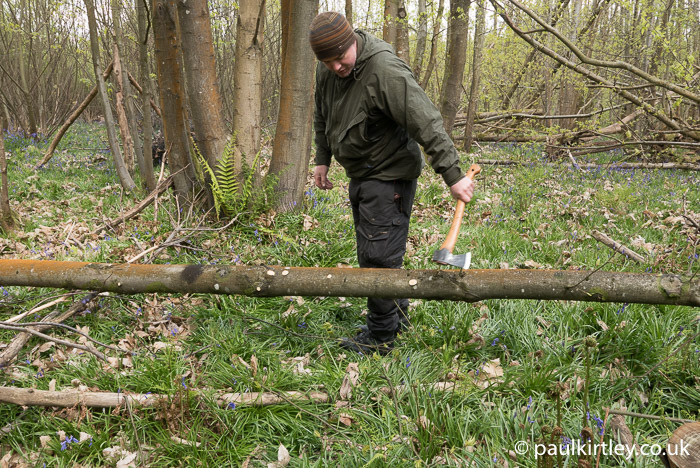 and I am glad to see that the principles are exactly the same – it would give me the confidence to have a go with the axe next time I’m out!! 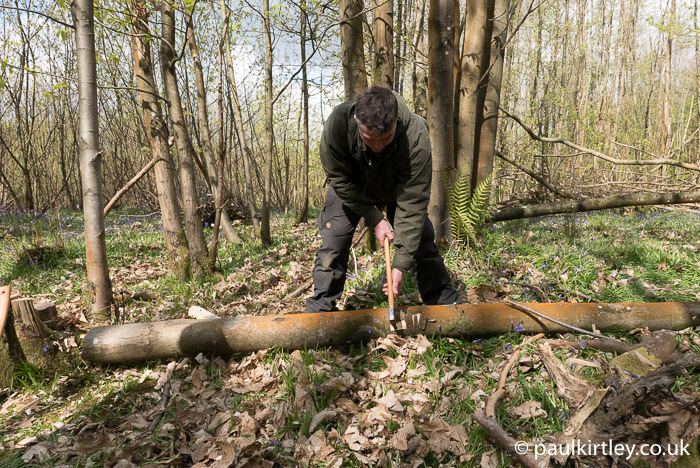 I am still very nervous about chunking out a length on the ground between my feet though as I know I have weak hands and a poor aim – but I could always stick to the saw for that bit just to be on the safe side!! It is a fantastic skill to have for anyone who spends time in the outdoors and safety of course is paramount – especially when working alone in remote areas. I commend you for offering good, accurate and free advise for those of us who need a bit of a push to try new things but lack confidence and support. thank-you or another clear and concise piece of instruction.The photos and links to other articles really make this excellent. All the best Dave H.
As ever, many thanks for another informative article. I do have one question, though. 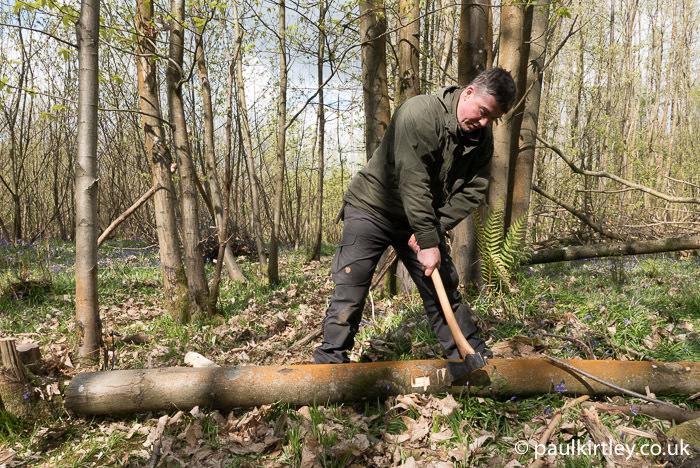 When cutting up the trunk into sections, I was always told that you should make the cuts so that there is absolutely no chance of the axe glancing off and injuring you. To achieve that, the recommendation is to stand sideways to the trunk and effectively make the cuts behind your legs. This does require a degree of ambidexterity but seems to make sense to me from a safety point of view. Even with the trunk between you and your axe, there is a chance that it could become deflected or, if the final few cuts, may slice through the remains of the trunk. If you are in the way, there is a distinct chance of injury; standing ‘sideways ahead’ does avoid that eventuality. I was also told that it is a good idea to place a second, similarly sized piece of wood between you and the trunk, to avoid an unanticipated slice through as the trunk gets thinner. The only reason that I raise this is that, in your photographs, you are cutting towards yourself. You adopt a wide, stable stance which should avoid any deflected blows hitting you but it would not do so entirely. I just wondered what your thoughts were on this point or have I been misled? It’s good to hear from you. It’s been a while. Good observations and good questions. 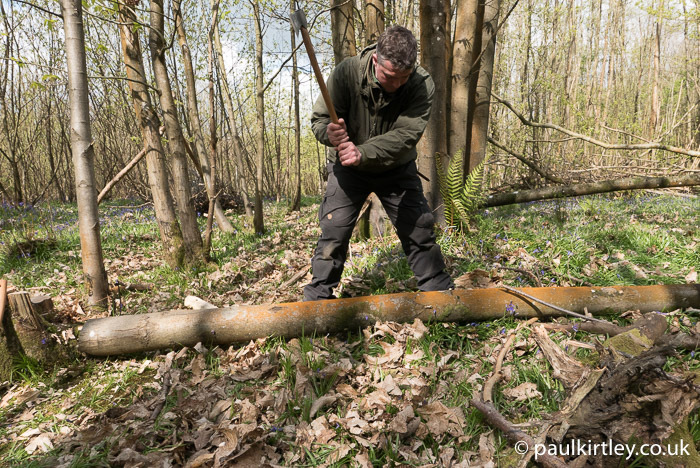 It is hard to section a log by cutting behind yourself as you not only have to switch hands ( not so bad) you also have to move your feet from one side to the other to step into the correct position to cut behind yourself. The method I am showing is a lot more efficient. But you are right, it does require some care. You have to have a degree of accuracy. On cutting through from one side it is unlikely that you will pass through the wood. On cutting from the other side it is necessarily so that you will cut through the log. So yes there is a heightened risk at this stage. If you feel more at ease not cutting towards yourself at this point, then it makes sense to step to one side and adopt more of the backwards cut approach you mention. Or a sideways croquet style cut if the axe is long enough. 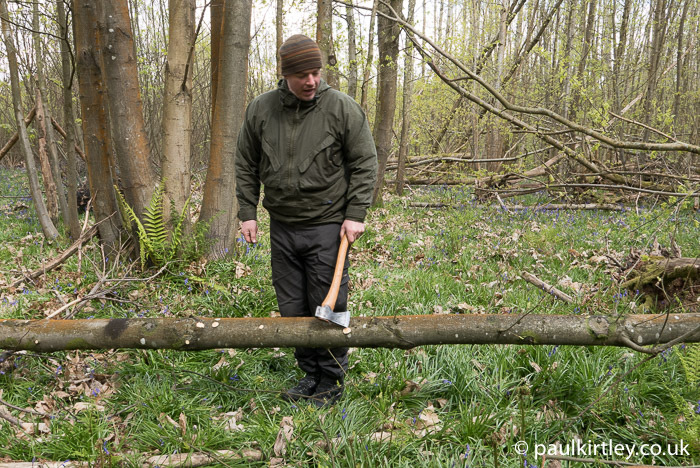 You can put another log inbetween you and the axe if you like but this can make you reach a bit further and can be hard on your back, particularly if it has a short handle. This is one excellent article and the “action photos” really express the safety aspect of ax work. The wilderness much less anywhere is no place for an accident with ax! I am archiving this post for resource. Although I was working in the timber industry and not recreation I have been cut by saws and hit by severed trees- no fun! Injuries to the head are very dangerous. Keep your tools sharp! It’s good to hear from you. I’m glad you liked this article. As always, I appreciate your comments.